I love to find real food products, just plain old ingredients, that taste great and fit the budget. 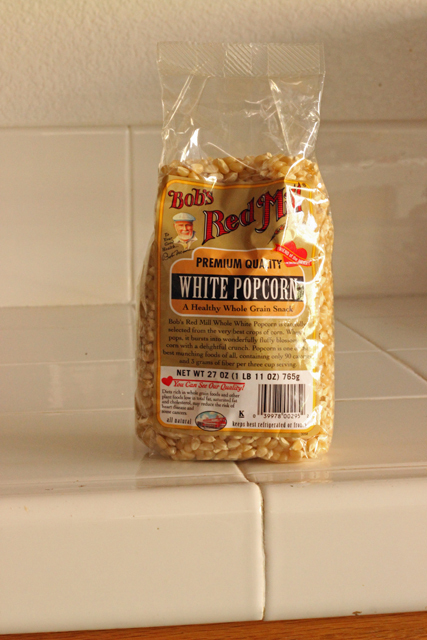 This White Popcorn from Bob’s Red Mill is one of them. Over the last couple years, I’ve made a big effort to reduce our family’s intake of processed foods. That means that I no longer buy a lot of things that were once commonplace in my cupboards. While I wasn’t ever a huge fan of the stuff, my kids and husband loved the convenience of microwave popcorn. Personally, I think it tastes fake. I much prefer air popped popcorn doused with butter. And since I learned what garbage is in microwave popcorn and found a great air popper AND keep butter and popcorn kernels on hand, I win. For awhile it was pretty hard to find an air popper. I remember the first winter we moved to Kansas and a friend wanted a popper like we had. There were none to be had. We’ve had our current machine (similar to this one) for a long time, and I have no plans to part with it anytime soon. At least once a week, we pop a couple batches of popcorn and enjoy them as a cheap and easy snack. While it makes more dishes than microwave corn, it tastes better, is healthier, and is super-duper easy to make. My six year old daughter can make popcorn for us. I currently buy Bob’s Red Mill White Popcorn via Amazon’s Subscribe and Save. It always pops up perfectly. The best thing? There isn’t any junk in this popcorn, unlike microwave popcorn that has all kinds of funky stuff in it. There are no GMO’s either since Bob’s Red Mill has always been free of genetically modified organisms. Disclosure: While I have worked for Bob’s Red Mill in the past, this post has not been compensated in any way. I am truly a fan of Bob’s Red Mill products and purchase them regularly. This post is part of a series where I share some of the products that I love and cook with often. Stay tuned for more “real food products we love”. Just in general, I have read so much about microwaves “ruining” good food, that nutrients are depleted etc. Can you speak to this? I honestly haven’t done much research on it. We use ours to reheat leftovers and that’s about it. Thank you so much Jessica…that helps so much. If people are looking for a specific popcorn popper, perhaps try farm supply stores? Up here in MN, we have Mills Fleet Farm, and they have entire aisles dedicated to popcorn poppers! We have a Whirley Pop stovetop popper, and make popcorn multiple times a week. $19.99 at a big box store and you can use their 20% off coupon. I think it tastes better than air-popped (though you do need 1 Tbsp oil). I’m with you on fresh-popped corn vs. microwave. We buy ours (grown on a local farm) at IGA. Yum! Really looking forward to this series. I feel like we eat a lot of real foods, but I know there’s room for improvement. Plus our little guy is moving out of baby food and toward table food, so I’m more aware of what will be going in his body. Thanks! Me too .. The only way to go is the Whirley Bird Popper … Unfortunately they began making them in China a few years ago, but I have the old style made in U.S.A. version and it makes the very best popcorn! We have one too from the days when my husband made kettle corn. I should bust that out from storage for a surprise. Love our Whirley Pop. I typically use coconut oil but for an extra special treat use bacon fat! I have never tried either. Will add that to the list! I usually buy popping corn from the bulk bin at Whole Foods. I may have to try Bob’s Red Mill popcorn (but I probably couldn’t tell the difference). Love organic popcorn and yes we use our Whirly Pop. Our organic buyer’s club has free delivery monthly from one of the big online organic grocery websites I bought a 25 lb bag of organic multi colored popcorn & my cost was $35.90. That turns out to be $1.44/lb or 9 cents an ounce. You can’t beat organic buyer’s clubs for saving money. I’d love to know about that website. Do you have to meet a truck or do they ship to your house? Jessica the website is Azure Standard (azurestandard.com). They deliver to us monthly via a semi. We have almost 15 drops in our area for our group and it takes the driver two days to make all our stops. Members of our organic buying group volunteer to host the stops and help unload that drop’s merchandise. We all pick up our orders the same day. They will also ship to your house for a fee but we incur no shipping fees when they deliver to us via the semi. Here’s a link to their drop page. You might have a drop already in your area and just not know about it. https://www.azurestandard.com/drop-point-locator Otherwise you might start your own drop. Ah yes. We have that here. The closest one is an inconvenient drive so I rarely order. I should check out the prices again, though. Maybe it’s worth it. I don’t know how it compares quality wise, but Trader Joe’s has organic popcorn kernels for $1.99/2 lb package. That’s where we usually buy ours, we’re huge popcorn fans over here too. Oops, the Trader Joe’s bag is 1 lb 12 oz not 2lb. Thanks for the tip! They were out of it here for a long time which is why I switched to the Amazon ordering. We love popcorn! We do ours on the stovetop with coconut oil. I have heard that at this point all popcorn is GMO free. Can anyone confirm that? That part I do not know. We go in popcorn spells. Just made a batch of delicious kettle corn last night. I had intended on bagging it up for snacks we ate it all too fast! How long does it last bagged? It does take some adjusting depending on your stove. I have found it to work best to add the oil, then the kernels. Let them warm up a bit and then add the sugar. We use the brown bag method as well. Works great! We go through too much for our family so a paper bag rarely works. Ha! My husband’s family has been growing popcorn in the garden for about 40 years. Every year we save a little seed for the next year. It is the best!